Save the CEO Newspaper Letter for the Big Stuff – StratGo Marketing. Plug-in marketing department services. It’s always interesting when a corporate CEO takes a newspaper ad. Typically, it’s part of a crisis management action plan. 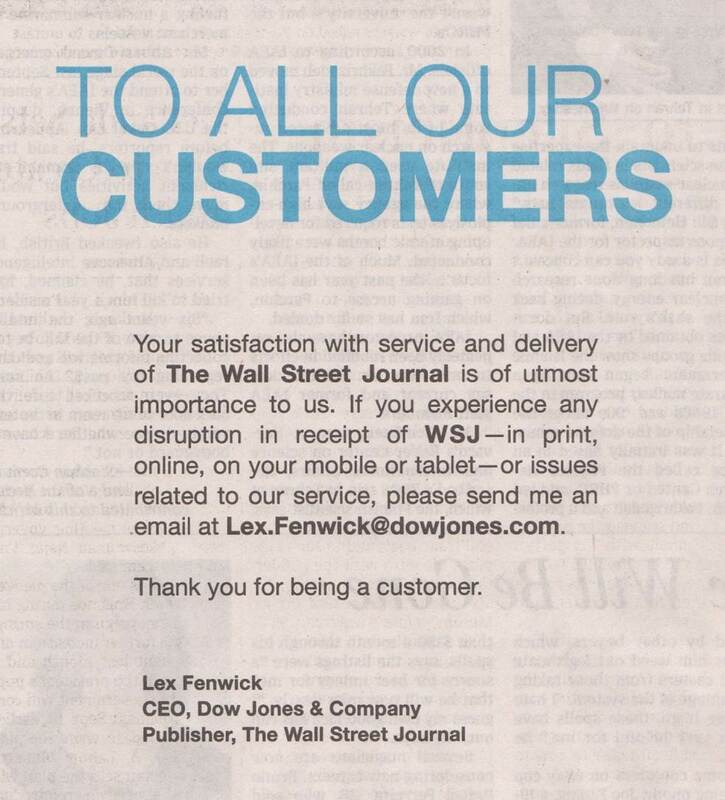 Does the WSJ have major service problems? Are they just being proactive on customer service? Or maybe sending a message to the internal team? If my paper isn’t in my driveway tomorrow morning, do I really need to tell the CEO? Is he the best person to credit my account or arrange to have someone drop off the paper later? I wonder how many emails he received after the ad was published? I also wonder if he gained any real learning or insight from his customers? I tend to think you roll out the most senior executives, especially the CEO, for public customer interaction such as newspaper ads only for the most important stuff. That’s not to say that product delivery is unimportant. Obviously, it’s critically important. But using Mr. Fenwick in this way just didn’t feel right to me. It came across as overkill and I think it diluted his CEO stature. The message would have been just as effective had it come from a Dow Jones team member outside the C-Suite. Save the CEO and C-Suite leaders for the most important customer communications. When he or she takes a large newspaper ad and gives out a personal email address, it should be vitally important and especially urgent.